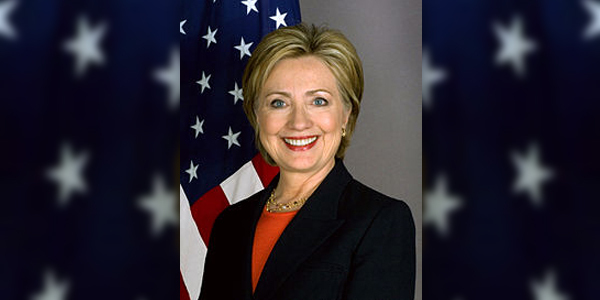 “I have a time sensitive matter to discuss re Guantanamo detainees and Bermuda,” Hillary Clinton appeared to have emailed in June 2009, according to one of her recently released emails. Mrs Clinton directed the email to Cheryl Mills, who served as her chief of staff at that time. Mrs Clinton — who served as U.S. Secretary of State from 2009 to 2013 and is now running for President — has been in the headlines due to her use of a private server to send and receive emails. Her lawyers turned over 55,000 pages of emails to the State Department, and the Department has been releasing many of them into the public domain. Another email contained in the release, also dated 2009, continues to discuss the Uighur situation, saying, “London appears to have been true to us. “Local report of the Governor’s comments follows: Britain views this as a breach of Section 62 of the Constitution, this was a matter of external affairs, the decision of the Bda Govt was unacceptable. 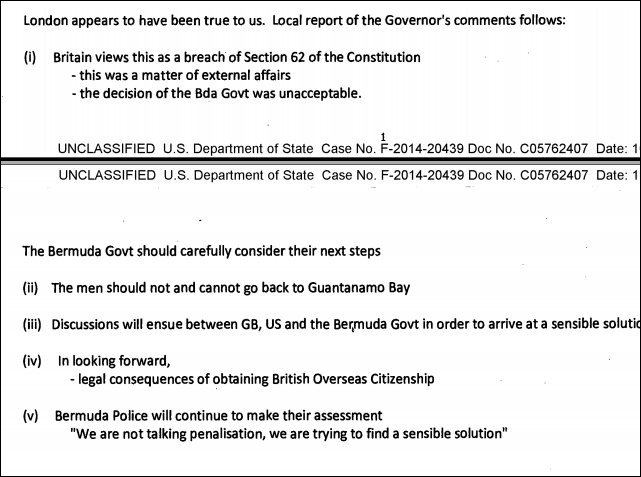 “The Bermuda Govt should carefully consider their next steps, the men should not and cannot go back to Guantanamo Bay. Bermuda should consider granting the Uighurs Bermuda status on the grounds of compassionate and international refugee grounds.Peace. You have people who were born and raised on this island who aren’t even considered Bermudian. Working class citizens who have been here for 40 years? I think a home free from persecution is good enough for now. This island needs to worry about Bermudian born teenagers/ early adults status before anyone else. The weegas should go live with DREB or Col Burch. After all, they ALONE were responsible for bringing them here. In fact the JUST way forward is for either DREB or Col Burch adopt them as family members. I waiting for the email that tells us who got what$$$$$$$$ for each Uighur? We or someone got something for this deal struck!! You mean like some $$$$ exchanged hands for the Airport deal? and some more $$$$ for the hotel deal? Must have been a Squid Fo Dah Bro…….. Still stinks after all these years. In that case we should also grant status to residents who have lived here peacefully and contributed for a decade and a half. At some point the Uighurs will presumably reach that point. How much have they sent back in remittance over what they have contributed? Has their employer put in all their payroll tax or has it been pocketed by employer and employee? It’s very easy to do so in a system that doesn’t have any way of enforcing the law like other progressive nations do. Who are you talking about? The Uighurs? Or the people who have been here, spending money on living here, and paying taxes here, more than 15 years? I’m talking about the ones who came here on permit after PLP was elected and are still here on permit at present. The none IB ones who’s permits kept being passed while much needed IB worker’s permits were being decline extensions. The ones who PLP keep failing to point out because they are not the scape goat white IB worker. The ones who were here during a period when over close to a billion dollars in earnings were sent abroad as remittances. The ones who managed to keep a job while so many Bermudians became unemployed. And bypass permanent residents who’ve been here for 30 years? Yeah, that promised to go over well. The reality is that, while I feel for these individuals, Bermuda should never have had to bear responsibility for them. Remember when they lost their jobs a few years back? What happened? The Government stepped in and found them jobs immediately. How many Bermudians you know nowadays struggling to find work? I’m sure we all know a few. It’s time for the UK Government and U.S Government to come together and come up with a proper LEGAL solution to this situation, instead of playing political football with these men( and their families) lives and using Bermuda as the playing field. Your one of those with a short memory or maybe your cronyism has just made you daft. Don’t you remember government’s platform of doing all they can to get unemployed Bermudians back to work. Instead they are doing all they can to get expats PR status and keep their job permanently. I’m not talking about IB Ray just to make it clear so your not deflecting my point. I’m talking about jobs that take less education. The type of jobs like your coworkers have that their country even after claiming poverty are able to have education for within their own country. Our country’s government who claims to be recession free spends millions on a rich man’s boat race instead of bringing in educators for those with high school diplomas. We need to look after our own, meaning persons that were born in Bermuda first, before assisting others. I agree. There are too many children of Bermuda who don’t have any rights…those weegas just gotta get in line!!! Its not up to Bermuda. Anyone who receives Bermudian status has to be a UK National. DREB knew this before he invited the Uighurs to stay, so why did he go ahead without consulting with the UK first? Takbir, in order to grant them status they first have to be granted UK citizenship. Unless the UK has changed its position on that it’s simply impossible to grant them status. But, if you really are in favour of granting them status I’m sure you agree that all the long term residents, including children who were born and grew up here, should be given the same consideration. Bermuda has done the U.S.?? Doesn’t she mean Ewart and the Colonel? Her gratitude appears to have vanished now that she has her hat in the ring! WHOA!!!! Who brought them here in the dead of night without consulting anyone who should have been consulted first? OOOPS! Responded in the wrong place. Should be to The Struggle is Real. To Triangle drifter: Whoa what? What about my comment led to your reaction? I’m aware of the shenanigans involved in getting him here. What is the Uighurs’ situation now, in February 2016? Right now they’re pretty much off the radar. Britain is already on record as saying they do not and will not qualify for British status, so by extension they cannot quality for Bermudian status. As far as I am aware they all( or some of them) have wives and offspring, so as many predicted it was never ‘just’ about the 4 of them. Because if you are offering them grounds to remain here stateless, you cannot then deny them from companionship or reproduction. So now Bermuda is responsible for them AND their families. Their children will never be able to travel. If Hillary Clinton becomes the next president of the United States than Bermuda in taking in the 4 Uighurs and starting the ball rolling for other countries to do the same; should be in position to call in a debt with respect to Bermuda/American relations. You’re assuming the favour wasn’t already paid off. It doesn’t work like that Alvin. You’re assuming that the “debt” hasn’t already been paid. What “debt” do you think exists, Alvin? If you believe Brown and Burch, they said there was no quid pro quo. That means there is no debt, Alvin. The US will give us nothing at all. Or are you telling us that Brown and Burch were untruthful, and that there was a quid pro quo of some sort? It is interesting to note that other countries who took on some of the Quighurs received compensation. Yet Bermuda( or a select few to be specific) received nothing. Yeah- and I have an ocean in the Atlantic for sale. And if Donald Trump becomes President Alvin? Like, we did them a favour so they do us a favour? I think that favour was already called in. What ever the cost of facilitating the men, and now their families, I’m very happy that future administrations will think twice before stepping over the boundary. Whitehall may just change the rules of self determination and grant independence if we keep on ‘misbehaving’ eh Walton? To have a future American President say she is grateful to Bermuda is priceless. Public sentiments notwithstanding, this is an important chip we may wish to cash in one day. Well done Dr. Brown. These men were innocent and needed somewhere to go. I agree that the people who are long term residents should get Bermudian status and their children as well. They are here, have helped to build the place, and will be here spending for generations more if we keep them onboard. It is clear now that Bermuda was asked by the US for a favor (OBAMA)when this was done. I Remember that this was around mid term elections and OBAMA administration had originally intended to settle them in Virginia and because of increased push back from his own party he reneged. During this time I read that the UK and other countries settled several but refused to take any more if the US did not do so as well. Before Mr. Obama leaves office in one year we should be officially asking him to find a solution to this problem that he created! or at the very least tells us what the true terms of the deal were…! We have Dr Brown to thank for this. He was only interested in what he could get out of Bermuda for himself . Some people are saying that we should be compassionate and just give them Bermuda passports. Whether you agree with this or not is completely irrelevant. Bermuda does not have the authority to make someone a British Overseas Territory Citizen without the approval of Great Britain, and they don’t approve, which is why they aren’t in Britain. This is why these gentlemen are in the predicament of being stateless in the first place. 1. They can’t go back to their homeland because just being arrested for terrorism by a foreign nation can warrant the death penalty, so their lives are in danger. 2. They can’t go back to Guantanamo because they are obviously innocent. 3. They can’t be release into the US populace because it would mean the American government would either have to admit that it has had some innocents being held captive, which they deny. Or they’d have to explain why they’re letting terrorists loose into the United States. A deal was made to sweep the problem under the rug. All the US officials needed was someone to pay off in order to take them. The Uighurs are infact the future of Bermuda – everyone else can go somewhere should they wish to (EU), and have the potential to leave Bermuda, but the 4 Uighurs and their many potential generations of offspring can go nowhere. Therefore in many generations we may find Bermuda becomes Chinese. Bermuda you are so lucky that the Uighurs did not marry Bermudians!! There would have been no way to deny them. They would have become British Overseas Territory Citizens and entitled to a Bermuda Passport(without status). Secondly after 10 years they would have been granted Bermuda Status and then UK status. Secondly, and its coming, once they receive a good human rights lawyer, they can file their case with the European Court as they are technically prisoners. this would be similar to the Uk case where they were keeping similar persons in prison because they could not send them back to their country if there is a risk that they will be tortured or killed. thirdly, are they on work permits? aren’t they taking bermudian jobs?or do they have a special provision where their contracts will always be renewed?what happens to their children, will they be asked to leave at 18 and to go where? Pretty soon the European Courts will force Bermuda to change their laws as it relates to residency and citizenship as they are contravening the European convention on Human rights. Bermudians can get upset, but its coming. if you don’t want it, get independent. or pray the UK leaves the EU!! If the UK leaves the EU, Independence will raise it’s ugly head again at some stage. COW! “Deed Done” – love that phrase…I say we put them on the next flight to the USA and drop ‘em off…they are their baggage, not ours!